While a free Expensify account is great, you can get a whole lot more value out of Expensify by upgrading! Your upgrade choice will depend on whether you want to use Expensify solo (to track your own spend, or submit to someone outside of Expensify) or you want to use Expensify for your company or group. 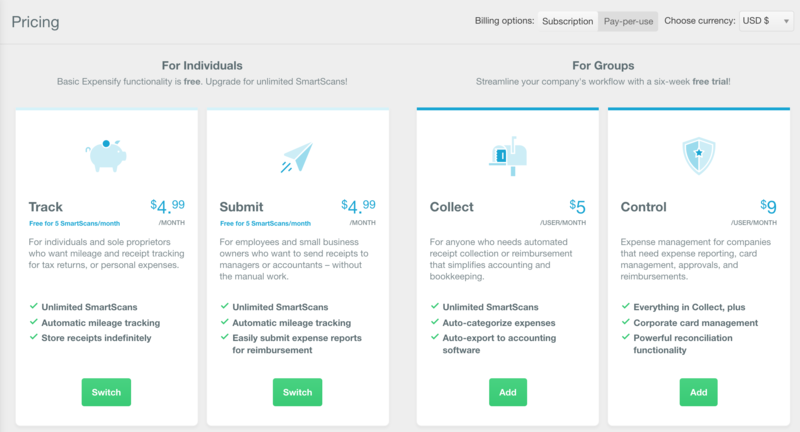 If you're currently using Expensify for free to Track or Submit expenses, then you're limited to 5 free SmartScans per-month. If you reach that limit, we'll prompt you to upgrade to an individual Monthly Subscription. If you'd like to upgrade immediately, you can go to Settings > Policies > Individual > Subscription and click Activate Subscription. 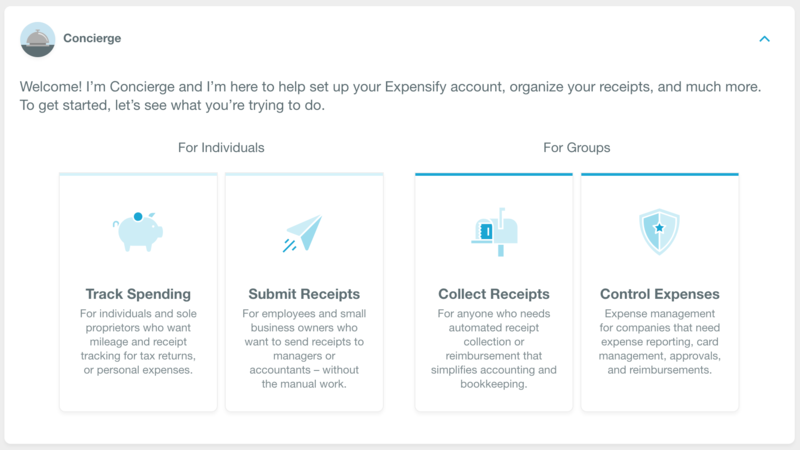 Your Expensify group policy is where you create expense rules, define approval workflows, manage integrations, configure reimbursements, and more. Expensify has two different group policy types: Collect and Control. Check out our policy types section to learn more about the different options. If you are a brand new user, you will see a task in your Inbox asking if you want to track, submit, collect, or control receipts. Choosing Collect Receipts will create a basic group policy, so go ahead and do that now. Selecting Submit Receipts or Track Spending will keep you on a free Expensify account, unless you choose to upgrade to an individual Monthly Subscription. Once you have created your group policy, you can see your subscription settings on your Settings > Policies > Group > Subscription page. To learn more about the various options, continue reading on the Billing Options help page.